Zach Redmond was given a 50-50 chance that he’d never play hockey again after a skate cut his femoral artery in a warm up two seasons ago. He ended up making a remarkable recovery and was back on the ice months later. He was with the Winnipeg Jets when the accident occurred. Now with the Colorado Avalanche after signing as a free agent in the offseason, he spent the first seven games of the season as a healthy scratch. Now due to an injury of a different kind to teammate Ryan Wilson, Redmond made his first appearance in an Avalanche sweater Friday night against Vancouver. He did well. Colorado have been in dire straights for the first few games of the season. While the season is still young, the team’s defensive corps has looked less than impressive. Redmond, who looked strong during training camp, was seen by some fans as a player who could come in and, if not make a difference, at least perform better than the likes of Ryan Wilson or Nate Guenin. A twitter campaign, #freeredmond, was even invented by some Avalanche fans on social media. With Wilson out, Avalanche fans got their wish. Redmond was given the start over Nate Guenin. Going into the game, Patrick Roy said he had no expectations for the 26-year-old. Roy simply wanted to see what Redmond could do without the added burden of any unnecessary expectations. Redmond didn’t play much, he only had around 12 minutes of ice time, which is low for a defenseman. But it was obvious to anyone watching that his play improved as the game progressed. Colorado defenders have had a bad habit of turning the puck over so far in this young season. But Redmond protected the puck well. He recorded zero giveaways during his time on the ice. Colorado desperately needed their depth defenseman to take better care of the puck, and in his first game Redmond succeeded in doing just that. He also was sound in other area’s in his own end. He was a big physical presence, that on at least one occasion he was able to take a Vancouver player out of the picture with a solid poke check or by playing the body. As the game wore on Redmond starting to impose himself offensively. One of the more impressive attributes he displayed was his decision-making. He was rather smart in getting the puck out of Colorado’s zone. In the Avalanche’s first seven games they had been too careless with passing out of the zone. Turnovers generally followed when a defenseman tried to force a pass up ice. Breakout passes are a great tool to start a rush but Colorado defenseman had been trying to force passes through their opponents rather than make the smart play. Redmond, on occasion was willing to skate with the puck, rather than just dump it off to a teammate and risk an interception. He recorded his first point as a member of the Colorado Avalanche doing just that. Redmond could have tried to rush the play and pass to one of the two forwards on his left. Instead he saw the space in front of him and skated into it. He chipped the puck in once he cleared the center line and let Colorado’s forecheck do the work. It’s a simply play and generally not one that requires much praise. But given Colorado’s defensive deficiencies in the first seven games, it was an encouraging sign. Redmond on a few occasion even led the rush up ice with Colorado’s forwards. He showed impressive skating ability for a player of his size, and his vision on the ice was definitely better than either Wilson or Guenin. Redmond isn’t going to be a miracle worker, and Colorado’s defense still needs to show improvement across all three pairings. But what makes Redmond’s debut in Denver so encouraging is that it offers Colorado a depth defenseman that can be reliable, and bring some of the same attributes that Tyson Barrie or Erik Johnson bring. Redmond isn’t either of those two players though, so expectations for him need to remain grounded. 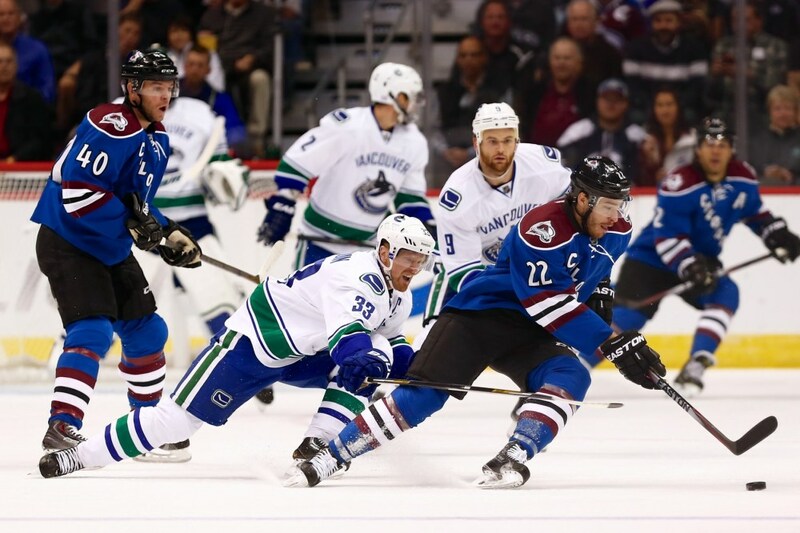 But his play against Vancouver suggests that the team can get over their early season slump. One thing Colorado needs is depth, especially on the blue line. If Redmond can continue to play like he did Friday night then it opens doors for Colorado. Redmond is less expensive than Ryan Wilson or Nate Guenin and with the Avalanche coming closer to the came they they’ve been in a few years that could prove vital. It’s still early in the season, and Colorado will still need to work hard every night to reverse their slow start. But Redmond is a potential upgrade at a position of weakness for Colorado. He’s not on the verge of become the next Shea Weber, but for a struggling Colorado hockey team, they just need him to be dependable. So far so good.